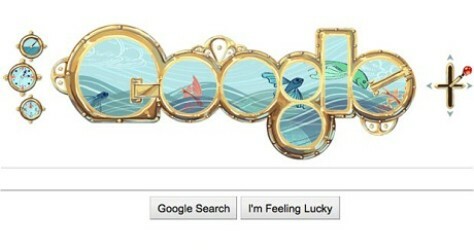 Check out Google's homepage today if you haven't already. To celebrate the 183rd birthday of author Jules Verne, Google added an interactive design to its homepage today that allows you to navigate a simulated submarine underwater as if you were in his book, "20,000 Leagues Under the Sea." To learn more about the man who is often called the Father of Science Fiction because he wrote – in great detail - about things like submarines before most people could ever imagine such things, google him. If you’re really interested in submarines, check out the Submarine Force Library and Museum in our home state of Connecticut. Located on the Thames River in Groton, the museum maintains the world's finest collection of submarine artifacts and is the only submarine museum operated by the United States Navy. It is also home to the modern day real life NAUTILUS - the world’s first nuclear–powered ship and the first vessel to go to the North Pole. Ironically, the museum is closed on Tuesdays during the winter and therefore they are not open to celebrate the birthday of Jules Verne today.